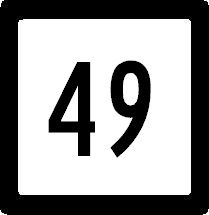 Connecticut State Route 49 is a north-south highway in Southeastern Connecticut. It runs from Connecticut State Route 2, at Stonington, to Connecticut State Route 14A, at Sterling. Info on CT St Rt 49 is broken down by county below.